Last weekend Ellie had a friend’s birthday party to attend. That’s always hard around our house. My girls are glued at the hip so when one of them is invited to a party and the other one isn’t, I usually have one pretty bummed out daughter. So to cheer Miss Addison up, I told her that we would have a special party. Just the two of us. 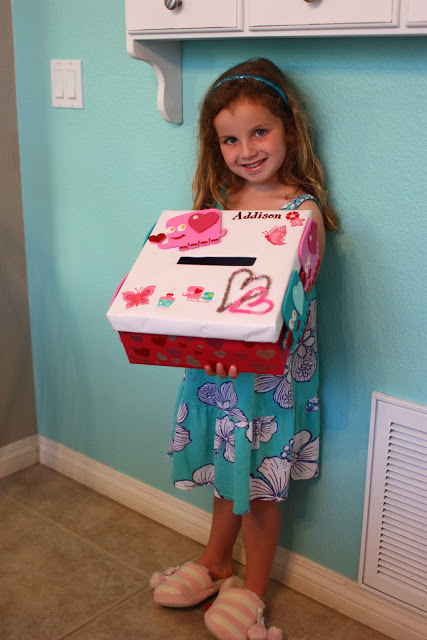 A party to make her Valentine box for school. Addison decided we would wear our house shoes and call it our “Valentine box house shoe decorating party.” So last Saturday afternoon Kenny took El to the birthday party. Kole took a nap. 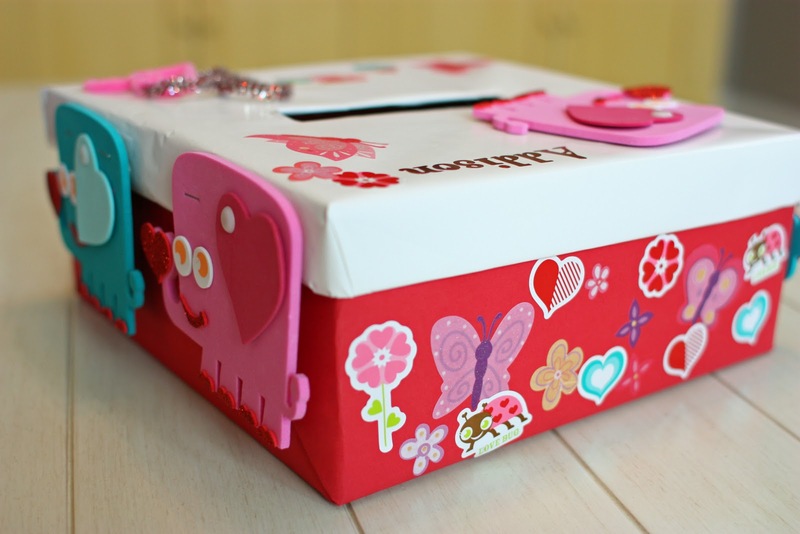 And Addie and I took up some serious Valentine box decorating. In our house shoes of course. This child of mine is so different from her sister. I remember helping Ellie with her Valentine box for Kindergarten. Ellie was so happy to have my help. She would have let me do the whole thing if I would have wanted to. Not Addison. This girl wants NO help. She wants to do everything herself. She always has. She has a pretty hard working, determined, stubborn little spirit. That sometimes drives me straight up a wall. And other times I love and admire like crazy. Ta da! 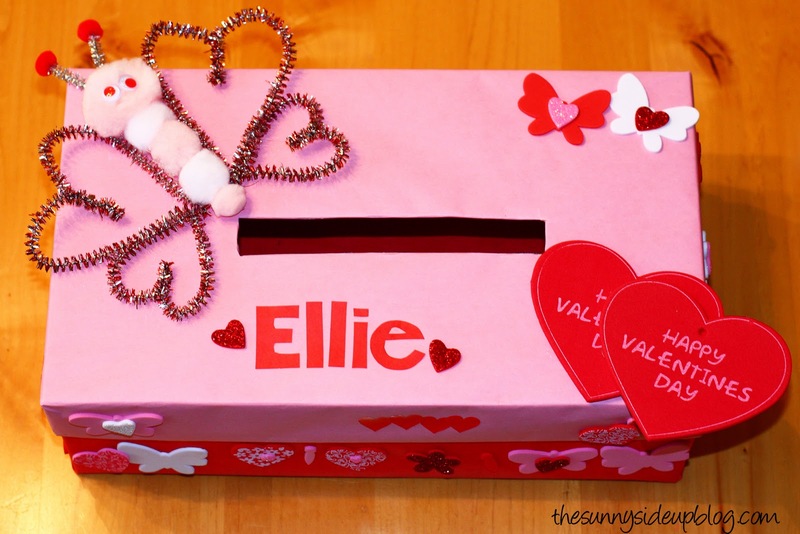 Her Valentine box in all its glory. And don’t forget to notice the house shoes. You can’t have a “Valentine box house shoe decorating party” without the house shoes. 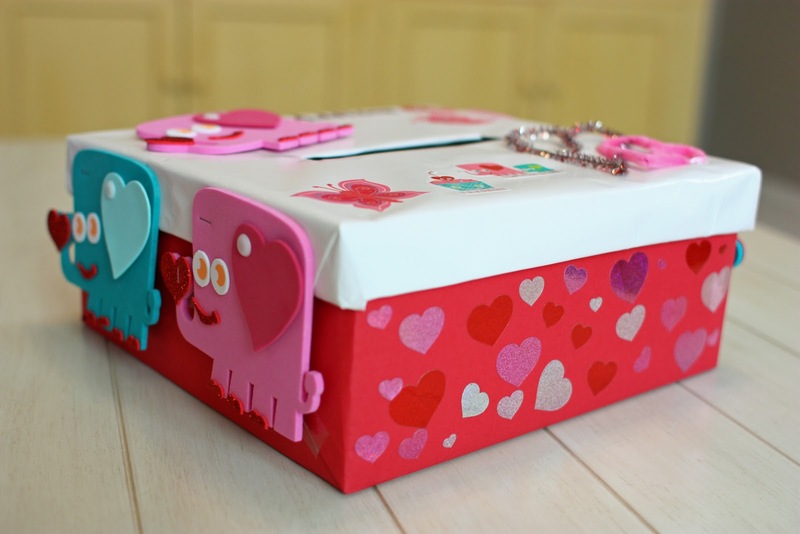 I was allowed to help cover the box in paper and to make the little hearts on the side, but that was it! Bummer for me. I love this kind of thing. I should have made my own box just for fun. 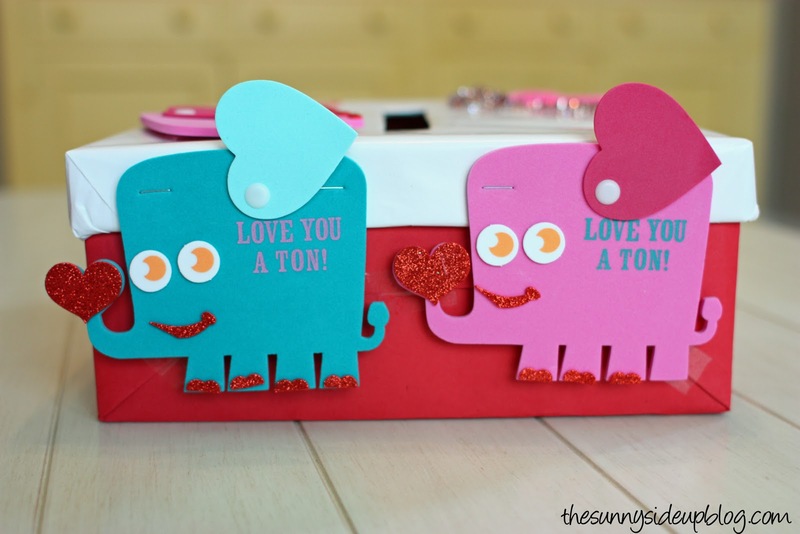 Aren’t these little elephants on the side adorable!? Target! A pack of them for $5.00! And easy for Addison to put together. Love it! 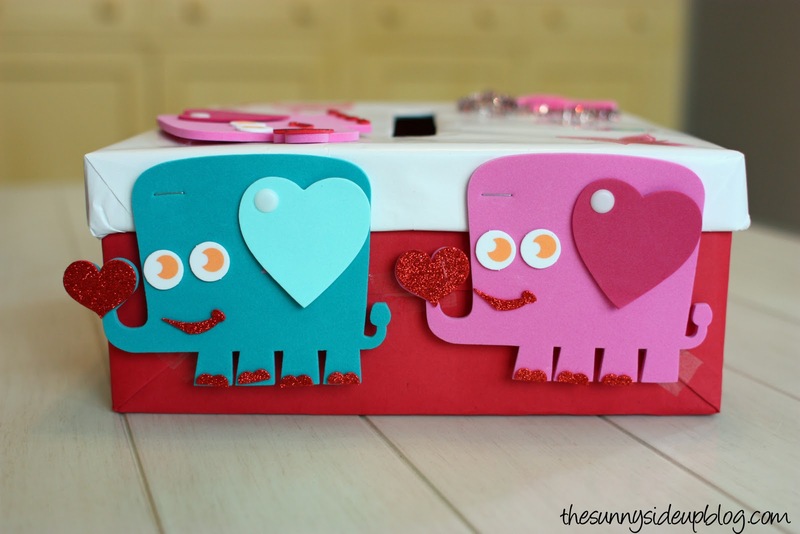 Elephants on two sides and stickers on the other two sides, exactly the way my girl wanted it. I also picked up these adorable matching sacks for my girls to carry their Valentines in. Target! $2.00 each! Love them. And I love Target. A fact that’s worth repeating. Here is the fun little friend I made for Ellie’s box two years ago. SO easy to make. And so fun that Ellie let her mom participate! Although I have to say that when it comes to regular homework – math, reading, spelling – I’m starting to appreciate Addie’s “do it myself” personality more and more. 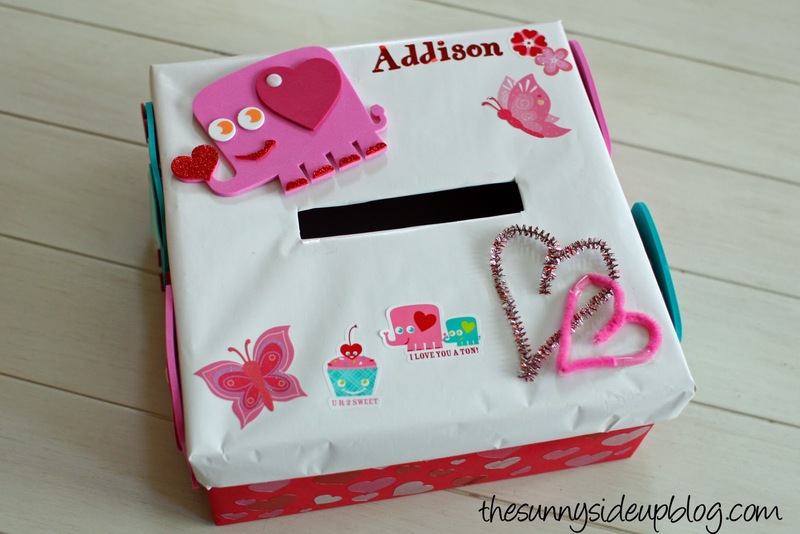 I know it’s a bit early to be turning in Valentine boxes at school, but in Kindergarten at our school they do the cutest mail unit. They turn in their boxes and cards early and learn all about sorting and delivering the mail. Addison has the same teacher Ellie did and it has been so fun re-living everything again this year. 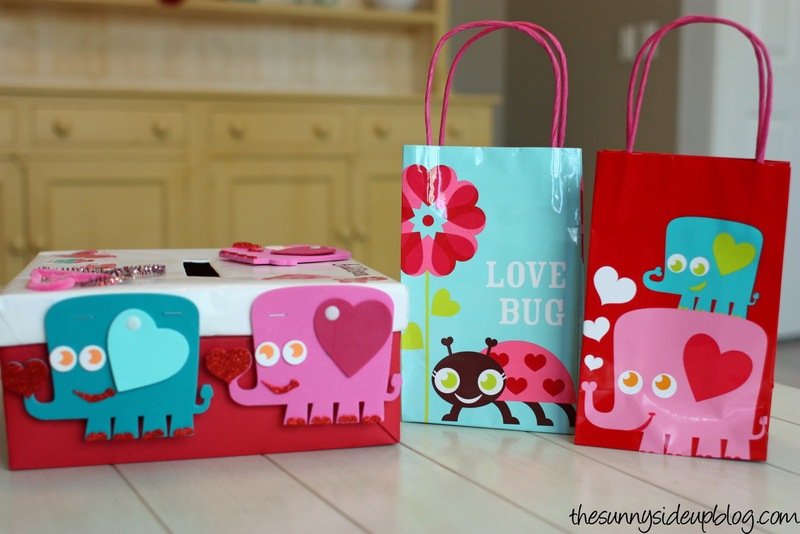 Happy Valentine box making everyone! Wear your house shoes if you work on one with your kids this year. It just seemed to make something good even better. I think her box came out so cute. I know how hard it is to want to help. I am so bad that I ask if I can just do it…lol. Love the mail truck too. I love that you get to share the same traditions with both your daughters. I cant wait for the day where we are not moving every 2-3 years. The boxes are adorable and the little elephants made me miss Target. Can I ask you a favor? Go spend an hour there for me? Is it too much to ask? :p. Have a great day. I remember when my girls were that small I would always ask the friend who was having a party if the other sis could come of course they’d say yes. Think I shoulda done that? Oh well. I don’t anymore. Anyway those boxes are soooo cute bet you were the coolest school teacher back in the day. 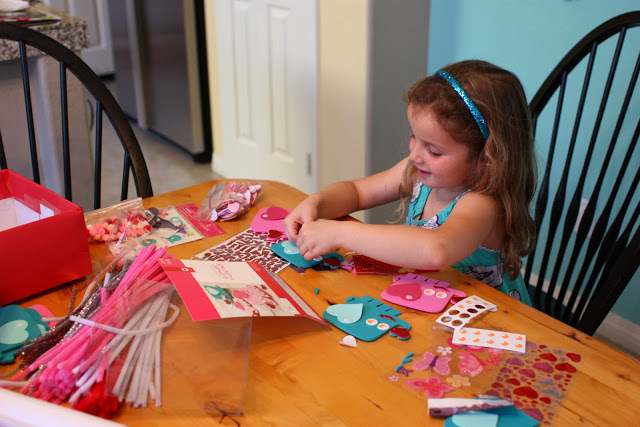 You share the most creative and fun ideas with your kiddos. The box is so cute! And, what a fabulous idea the teacher came up with. How fun and yes what a grandpa! We love the St. George target. Found a fun pair of boots there last week. OK..I love the box, but I LOVE TARGET TOO! Seriously,I can’t get out of there without spending at least $100 every time! Going to head there tomorrow and pick up some Valentine’s decor for my girls! Thanks! 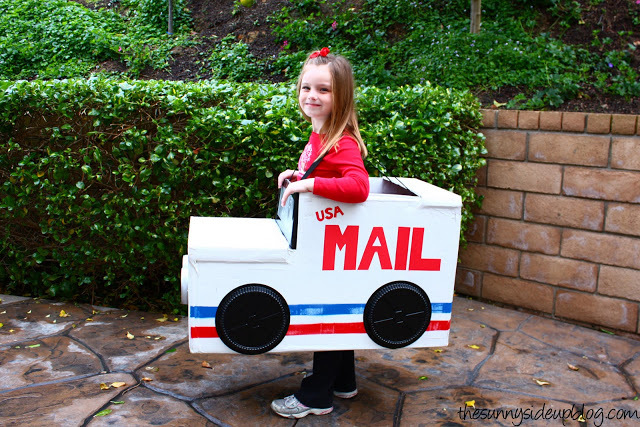 That mail truck is so cute! What a fun idea! 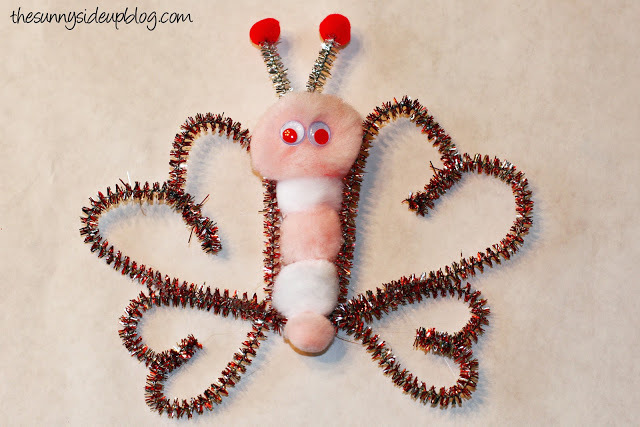 Amelia saw Ellie’s box and said, “I want to make one just like that with a butterfly!” Guess I’ll go into the “big city” for some supplies in the next few days! Now I’m feeling inspired to do this super cute mail unit with my kiddos at school!